MELBOURNE: Environmental officers in Australia were Thursday investigating the death of 27 penguins they believe were killed by a dog or a pack of dogs, ironically at Cat Bay. 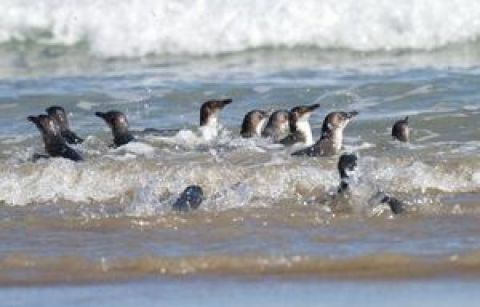 The protected Little Penguins were found mauled on Wednesday in the Phillip Island Nature Park in Victoria state, a popular tourist attraction. "Department of Sustainability and Wildlife officers are investigating the cause of death, however preliminary observations of the injuries are consistent with a dog attack," a department spokesman said. The Little Penguin, also known as the Fairy Penguin, is the world's smallest penguin species and the only one permanently found in Australia. Phillip Island is home to one of the world's largest colonies and every night hundreds of the birds swim ashore and make their way to their homes in the nature reserve. Known as the Penguin Parade, the spectacle attracts thousands of people each year.